Image caption Chef Jay Fai's tom yum gung is renowned in Bangkok, but can it pass a robot taste test? At a small laboratory in a Bangkok suburb, a group of scientists has come up with what they hope is the answer to an old conundrum: how to tell if a Thai dish is authentic or not. It carries the simple name e-Delicious, and it takes the form of a box about the size of a large printer, containing sensors, and some computer circuitry, which act as an electronic tongue and nose. It was developed by Thailand's National Innovation Agency, at a total cost of $1m (£640,000), after former Prime Minister Yingluck Shinwatra complained about the poor versions of Thai food she was subjected to during her overseas trips. A Thai Delicious committee was formed - a bit like the French Appellation d'Origine Contrôlée for food and wine - and around 200 people were invited to sample different versions of classic Thai dishes like tom yum gung (sour prawn soup) and kaeng khiao wan (green curry). Whichever version was the consensus winner was taken as the standard, although the designers acknowledge that as the sampling was done in Bangkok, inevitably their standards for now are Bangkok versions. The e-Delicious machine has nine sensors in it to measure the balance of six Thai flavours - sweet, sour, bitter, salty, savoury and spicy - and the food's aroma. There is also a sensor to assess the dish's visual presentation, which is always very important in Thai cooking. But can it actually tell you if the dish is any good? "The machine can't tell you if something is delicious or not," says Nakah Thawichawatt, an entrepreneur who carries the grand title of Innovation Ambassador. "The sensors give a taste-reading that we can understand. So if we like a certain taste, but can't explain what that taste is to someone else, the machine will able to decipher it, and record the data as a standard for other dishes." We decided to give the e-Delicious a test. We had seen it sample low-cost versions of the recipes in its database - only three for now, but soon to reach 10 - and found them all wanting. But how would it cope with the tom yum gung that is judged by many in Bangkok to be the finest in the city? You won't find it in a ritzy restaurant in Bangkok's upmarket neighbourhoods, where Italian or Japanese cuisine is popular. 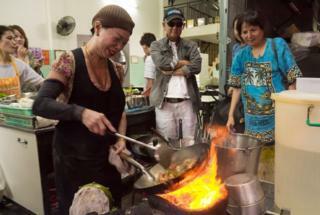 Jay Fai, a formidable-looking woman in trademark beanie-hat and fire-engine slash of lipstick, is sometimes called the Mozart of the Wok, for the lightning speed and instinctive flair with which she wields that most essential tool for East Asian cooking. Her pad kee mao, or drunken noodles, is renowned: thick strips of white rice noodles fried in seconds over a roaring charcoal brazier, the meat, seafood, vegetables and chillies seared, glazed and smoky. But it is her tom yum gung they queue up for, despite a price tag that reaches $50 (£32) for a large bowl. Jay Fai tells me she learned her recipes from the old women who used to cook for the community on the village where she grew up. She is meticulous about ingredients, searching for the very freshest jumbo prawns, the most fragrant herbs - and tom yum gung relies a great deal on the galangal, lemon grass and lime leaves that flavour it, along with the fermented fish sauce, tamarind, lime juice, chillies and red onions. Watching her hurling great handfuls of herbs into the furiously boiling pot, it is hard to see any precision. And yet, after a couple of minutes she produces a soup of exquisite, overpowering taste and aroma. Once eaten, never forgotten, and for this reviewer, never equalled. At the Thai Delicious lab we spooned some of Jay Fai's soup into two glass beakers - one for taste, one for smell - and slid them into the e-Delicious machine. After a minute's processing, it delivered its verdict; for taste, 90%. For aroma, 100% - the highest score of any tom yum gung it had assessed. So perhaps a machine can judge great cooking. For a final view I called the chef at the first Thai restaurant ever to win a Michelin star: David Thompson, a true global culinary celebrity. His Bangkok restaurant Nahm has repeatedly been voted as one of the world's finest. "It's an impossible dream, to set one standard," he said. "Taste is so subjective." "There are standards, but the art of cooking is the epitome of humanity, with differences in taste, seasoning and technique that express the cook's character." And what about a taste robot? "It's a gimmick, a foolish idea," he said. "Any cook, any sound practitioner or craftsman knows that a robot can never analyse the product of the human hand." The developers of the e-Delicious machine are undeterred. Despite its high cost - at least $18,000 (£11,455) per unit - they hope they can sell a few to each country where Thai food has taken off, to offer at least a consistent standard by which Thai restaurants can come and have their versions of the Thai classics judged. And if that does not take off, they have also come up with a Thai Delicious app for smartphones.